It seems that when Lum was born, a postal screwup resulted in a witchy friend of the family not getting an invitation to the celebration. The witch put a curse on Lum-- that she would never be happy with her True Love. In the present, a new Amusement Park has been built in Tomobiki, and opening day finds the whole gang sampling its pleasures. At a magic show, however, Ataru gets turned into a large pink hippo-potamus-- FOR REAL! When Lum attempts to track down the magician that transformed her Darling, things start to get very weird, very fast! Urusei Yatsura 3: Remember My Love is well-executed, high-quality, comedy fantasy adventure, with very good music, highly recommended. It is my personal favorite of the Urusei Yatsura movies. This film has all the slapstick comedy and all the stock characters one expects from an Urusei Yatsura movie. It also has much the same dreamlike quality of the second and fourth movies, but it is better plotted and more comprehensible than either one. It is the story of a terrible curse, of a scheme of love and revenge spanning centuries of time and light-years of space. This scheme produces a fantastic, otherworldly, sinister carnival, where Ataru and his friends find themselves confronting their inner desires and fears. The scheme culminates with the transformation of Ataru (into a pink hippopotamus) and the disappearance of Lum. 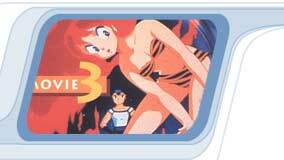 The rest of the movie deals with the unexpected effects of Lum's absence, and the quest to get her back.